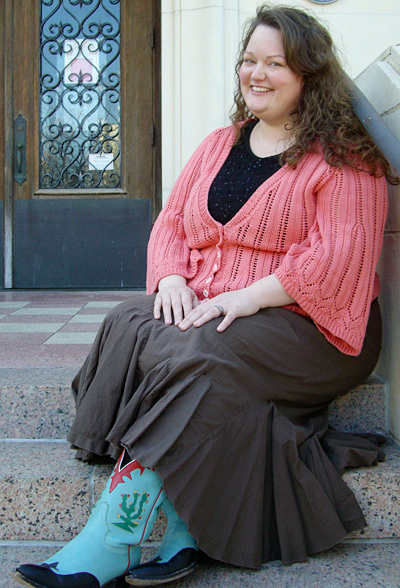 When I moved to Texas back in 2006, I joined a knitting circle and started knitting with the big girls. Now, I’ve been knitting The gals inspired me to design a garment for a grown-up: an insanely complicated lace-trimmed cardigan that I ripped out and started over at least twice to get it just right. When I finished it, I felt like I was finally a big girl, too! 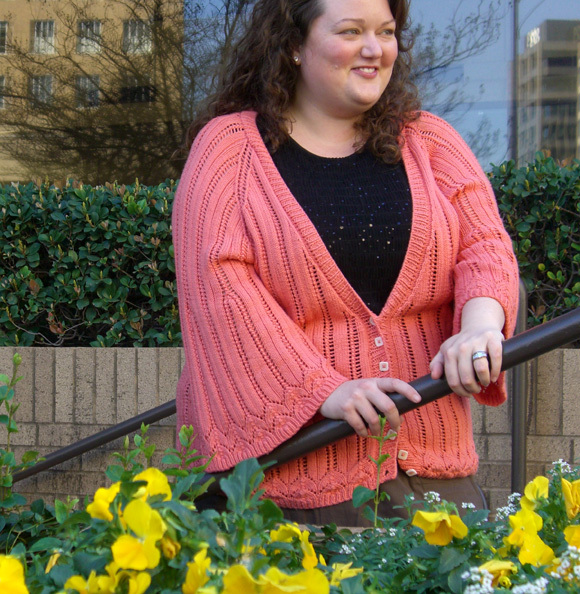 Only, big girls don’t live in a one-size-fits-all world…and my new sweater defied my attempts to resize it. (Just try figuring out how to do that when you’ve used two stitch patterns, one that’s a seven-stitches-plus-two repeat, and one that’s a nine-stitches-plus-one repeat. I’ve had five years of grad school, and I am still working on that math.) So the next time I made a sweater, I resolved that it should be something I could resize and share with my gals—all sizes of ‘em. Voila: Decimal. 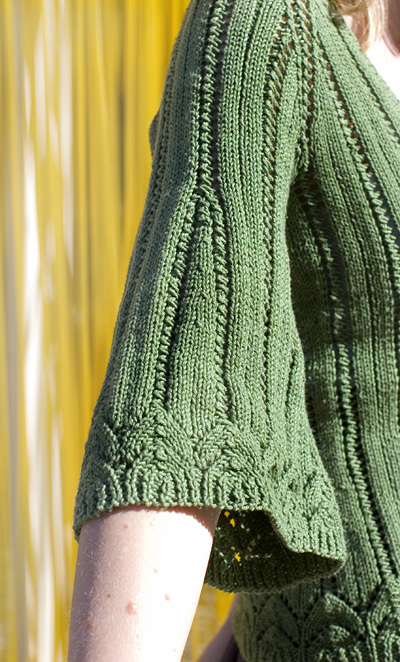 An airy cotton lace cardigan that works whether it’s 100 Fahrenheit outside or 10 Celsius in the movie theater, it uses a ten-stitch repeat that has proven way easier to, well, de-small. 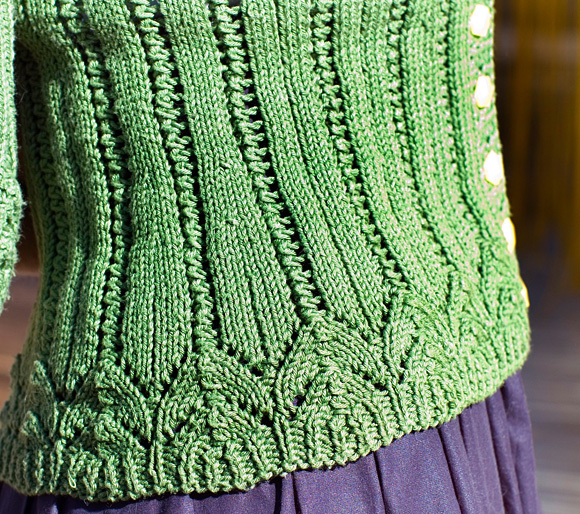 The lace trim and eyelet ribbing is a minor variation on the Gazebo Lace from Nicky Epstein’s Knitting on the Edge — one of the first books I got when I started running with the big girls. The subtle waist shaping is optional if you’d rather have room to roam around the midsection, and the flared ¾-length sleeves add some swingy spring style, too. sssk: Slip next 3 sts knitwise, one at a time, to right needle. Insert left needle into fronts of these 3 sts and knit them together. 2 sts decreased. Row 1 [RS]: P1, k1, [yo, k3, sk2p, k3, yo, k1] to last st, p1. Row 2 [WS]: K1, p to last st, k1. Row 3 [RS]: P2, [k1, yo, k2, sk2p, k2, yo, k1, p1] to last st, p1. Row 4 [WS]: K2, [p9, k1] to last st, k1. Row 5 [RS]: P2, [k2, yo, k1, sk2p, k1, yo, k2, p1] to last st, p1. Row 6 [WS]: Work as for Row 4. Row 7 [RS]: P2, [k3, yo, sk2p, yo, k3, p1] to last st, p1. Row 8 [WS]: Work as for Row 4. Row 1 [RS]: P2, [k3, yo, sk2p, yo, k3, p1] to last st, p1. Row 2 [WS]: K2, [p9, k1] to last st, k1. Repeat these 2 rows for Eyelet Rib Pattern. When working neckline and raglan shaping in lace pattern, be sure that every increase [yo] in the lace pattern is paired with a corresponding decrease. When there are only enough sts in pattern to work one [yo] instead of both [yo]s in the lace rib pattern, work a [ssk] instead of a [sk2p]. Using longer circular needle, CO 165[185, 205, 225, 245, 265, 285] sts. Row 2 [WS]: Sl 1, [k1, p1] to end. Row 3 [RS]: Sl 1, [p1, k1] to end. Row 8 [WS]: Sl1, k1, p to last 2 sts, k1, p1. When working Lower Body and Yoke, maintain edge sts as set: Slip first st of each row, k last st of every RS row, p last st of every WS row. These edge sts are not counted in st patterns (Border Pattern and Eyelet Rib Pattern). Work Rows 1-8 of Border Pattern twice. Work 11[11, 11, 13, 13, 15, 15] rows in Eyelet Rib Pattern, ending with a RS row. Set-up Row [WS]: Work 29[-, 39, -, 49, -, 59] sts in pattern, place marker, work 27 sts in pattern, place marker, work 53[-, 73, -, 93, -, 113] sts in pattern, place marker, work 27 sts in pattern, place marker, work remaining 29[-, 39, -, 49, -, 59] sts in pattern. Decrease Row 1 [RS]: [Work in pattern to marker, k3, k2tog, k2, yo, sk2p, yo, k3, p1, k3, yo, sk2p, yo, k2, ssk, k3, slip marker] twice, work in pattern to end. 161[-, 201, -, 241, -, 281] sts; 25 sts between each pair of markers. Work 5[-, 5, -, 7, -, 7] rows in pattern. Decrease Row 2 [RS]: [Work in pattern to marker, k2, k2tog, k2, yo, sk2p, yo, k3, p1, k3, yo, sk2p, yo, k2, ssk, k2, slip marker] twice, work in pattern to end. 157[-, 197, -, 237, -, 277] sts; 23 sts between each pair of markers. Decrease Row 3 [RS]: [Work in pattern to marker, k1, k2tog, k2, yo, sk2p, yo, k3, p1, k3, yo, sk2p, yo, k2, ssk, k1, slip marker] twice, work in pattern to end. 153[-, 193, -, 233, -, 273] sts; 21 sts between each pair of markers. Work 37[-, 39, -, 43, -, 45] rows in pattern. Important: Read ahead! Waist shaping and neckline shaping directions are worked at the same time, starting on the next row. Increase Row 1 [RS]: [Work in pattern to marker, k2, m1, k2, yo, sk2p, yo, k3, p1, k3, yo, sk2p, yo, k2, m1, k2, slip marker] twice, work in pattern to end. 23 sts between each pair of markers. Increase Row 2 [RS]: [Work in pattern to marker, k3, m1, k2, yo, sk2p, yo, k3, p1, k3, yo, sk2p, yo, k2, m1, k3, slip marker] twice, work in pattern to end. 25 sts between each pair of markers. Increase Row 3 [RS]: [Work in pattern to marker, k3, m1, k3, yo, sk2p, yo, k3, p1, k3, yo, sk2p, yo, k3, m1, k3, slip marker] twice, work in pattern to end. 27 sts between each pair of markers. Work 19[-, 21, -, 23, -, 25] rows in pattern, or until work is desired length to underarm. AT THE SAME TIME, shape neckline as follows, beginning on same row as Increase Row 1. Note that for most sizes, neckline shaping will continue into yoke; keep track of the number of neckline shaping rows you have worked. Neckline Decrease Row [RS]: Sl 1, p2, ssk, work in pattern to last 5 sts, k2tog, p2, k1. Repeat these 4 rows 9[-, 14, -, 14, -, 19] times more. Next Row [RS]: [Work in pattern to marker, remove marker, work 7 sts in pattern, yo, k1, BO 11 sts knitwise (1 st on right needle after BO sts), yo, work 7 sts in pattern, remove marker] twice, work in pattern to end. There are 129[-, 169, -, 207, -, 247] sts: 29[-, 39, -, 48, -, 58] sts for each front, and 71[-, 91, -, 111, -, 131] sts for back. Note that if you have changed the number of rows worked since the beginning of the neckline shaping, you may have a different number of sts in each front. Set aside with yarn attached, and work sleeves. Set-up Row [WS]: Work -[40, -, 50, -, 60, -] sts in pattern, place marker, work 15 sts in pattern, place marker, work -[75, -, 95, -, 115, -] sts in pattern, place marker, work 15 sts in pattern, place marker, work remaining -[40, -, 50, -, 60, -] sts in pattern. Decrease Row 1 [RS]: [Work in pattern to marker, k2, k2tog, k2, yo, sk2p, yo, k2, ssk, k2, slip marker] twice, work in pattern to end. -[181, -, 221, -, 261, -] sts; 13 sts between each pair of markers. Work -[5, -, 7, -, 7, -] rows in pattern. Decrease Row 2 [RS]: [Work in pattern to marker, k1, k2tog, k2, yo, sk2p, yo, k2, ssk, k1, slip marker] twice, work in pattern to end. -[177, -, 217, -, 257, -] sts; 11 sts between each pair of markers. Decrease Row 3 [RS]: [Work in pattern to marker, k2tog, k2, yo, sk2p, yo, k2, ssk, slip marker] twice, work in pattern to end. -[173, -, 213, -, 253, -] sts; 9 sts between each pair of markers. Work -[39, -, 41, -, 45, -] rows in pattern. Increase Row 1 [RS]: [Work in pattern to marker, k1, m1, k2, yo, sk2p, yo, k2, m1, k1, slip marker] twice, work in pattern to end. 11 sts between each pair of markers. Increase Row 2 [RS]: [Work in pattern to marker, k2, m1, k2, yo, sk2p, yo, k2, m1, k2, slip marker] twice, work in pattern to end. 13 sts between each pair of markers. Increase Row 3 [RS]: [Work in pattern to marker, k2, m1, k3, yo, sk2p, yo, k3, m1, k2, slip marker] twice, work in pattern to end. 15 sts between each pair of markers. Work -[21, -, 23, -, 25, -] rows in pattern, or until work is desired length to underarm. Repeat these 4 rows -[9, -, 14, -, 19, -] times more. Next Row [RS]: [Work in pattern to marker, remove marker, k2, BO 11 sts knitwise, k1 (2 sts on right needle after BO sts), remove marker] twice, work in pattern to end. There are -[145, -, 183, -, 223, -] sts: -[33, -, 42, -, 52, -] sts for each front, and -[79, -, 99, -, 119, -] sts for back. Note that if you have changed the number of rows worked since the beginning of the neckline shaping, you may have a different number of sts in each front. Using shorter circular needle, CO 123[123, 123, 153, 153, 153, 183] sts. Do not join; sleeve is worked back and forth. These 2 rows set 1x1 Rib for sleeve. Work 5 more rows in 1x1 Rib, ending with a RS row. Row 8 [WS]: K1, p to last st, k1. Work 11[11, 13, 13, 15, 15, 17] rows Eyelet Rib Pattern, ending with a RS row. Set-up Row [WS]: Work 14 sts in pattern, place marker, [work 15 sts in pattern, place marker] 7[7, 7, 9, 9, 9, 11] times, work remaining 4 sts in pattern. Decrease Row 1 [RS]: [Work in pattern to marker, k1, yo, sk2p, yo, k3, k2tog, k2, yo, sk2p, yo, k1, slip marker] 4[4, 4, 5, 5, 5, 6] times, work in pattern to end. 119[119, 119, 148, 148, 148, 177] sts. Decrease Row 2 [RS]: [Work in pattern to marker, k1, yo, sk2p, yo, k2, k2tog, k2, yo, sk2p, yo, k1, slip marker] 4[4, 4, 5, 5, 5, 6] times, work in pattern to end. 115[115, 115, 143, 143, 143, 171] sts. Decrease Row 3 [RS]: [Work in pattern to marker, k1, yo, sk2p, yo, k2, k2tog, k1, yo, sk2p, yo, k1, slip marker] 4[4, 4, 5, 5, 5, 6] times, work in pattern to end. 111[111, 111, 138, 138, 138, 165] sts. Decrease Row 4 [RS]: [Work in pattern to marker, k1, yo, sk2p, yo, k1, k2tog, k1, yo, sk2p, yo, k1, slip marker] 4[4, 4, 5, 5, 5, 6] times, work in pattern to end. 107[107, 107, 133, 133, 133, 159] sts. Decrease Row 5 [RS]: [Work in pattern to marker, k1, yo, sk2p, yo, k1, k2tog, yo, sk2p, yo, k1, slip marker] 4[4, 4, 5, 5, 5, 6] times, work in pattern to end. 103[103, 103, 128, 128, 128, 153] sts. Decrease Row 6 [RS]: [Work in pattern to marker, k1, yo, sk2p, yo, k2tog, yo, sk2p, yo, k1, slip marker] 4[4, 4, 5, 5, 5, 6] times, work in pattern to end. 99[99, 99, 123, 123, 123, 147] sts. Decrease Row 7 [RS]: [Work in pattern to marker, k1, yo, ssk, sk2p, k2tog, yo, k1, slip marker] 4[4, 4, 5, 5, 5, 6] times, work in pattern to end. 91[91, 91, 113, 113, 113, 135] sts. Decrease Row 8 [RS]: [Work in pattern to marker, k1, yo, sl 2, k3tog, pass both slipped sts over, yo, k1, slip marker] 4[4, 4, 5, 5, 5, 6] times, work in pattern to end. 83[83, 83, 103, 103, 103, 123] sts. Shaping is complete; remove markers on next row. Work 16 rows in pattern or until sleeve is desired length to underarm, ending with a WS row. Next Row [RS]: BO 6 sts, work in pattern to last 6 sts, BO remaining 6 sts. 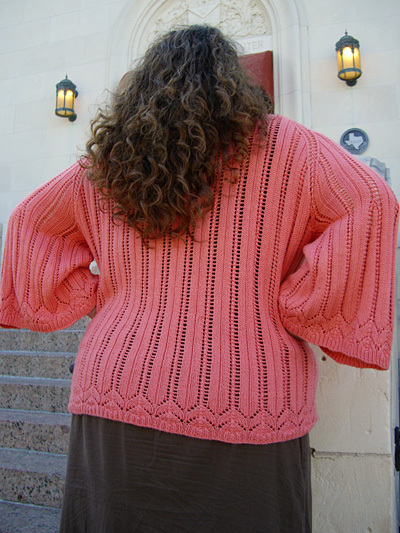 Work 15 rows in pattern or until sleeve is desired length to underarm, ending with a RS row. Next Row [WS]: K1, p2tog, work in pattern to last 3 sts, p2tog tbl, k1. Next Row [RS]: BO 1 st, work in pattern to last 11 sts, BO remaining 11 sts. Break yarn, leaving a long tail to use for seaming. Slip remaining 71[71, 71, 91, 91, 91, 111] sts to spare circular needle; set aside and work right sleeve. Work as for left sleeve to beginning of sleeve shaping. Set-up Row [WS]: Work 4 sts in pattern, place marker, [work 15 sts in pattern, place marker] 7[7, 7, 9, 9, 9, 11] times, work remaining 14 sts in pattern. Decrease Row 1 [RS]: [Work in pattern to marker, k1, yo, sk2p, yo, k2, ssk, k3, yo, sk2p, yo, k1, slip marker] 4[4, 4, 5, 5, 5, 6] times, work in pattern to end. 119[119, 119, 148, 148, 148, 177] sts. Decrease Row 2 [RS]: [Work in pattern to marker, k1, yo, sk2p, yo, k2, ssk, k2, yo, sk2p, yo, k1, slip marker] 4[4, 4, 5, 5, 5, 6] times, work in pattern to end. 115[115, 115, 143, 143, 143, 171] sts. Decrease Row 3 [RS]: [Work in pattern to marker, k1, yo, sk2p, yo, k1, ssk, k2, yo, sk2p, yo, k1, slip marker] 4[4, 4, 5, 5, 5, 6] times, work in pattern to end. 111[111, 111, 138, 138, 138, 165] sts. Decrease Row 4 [RS]: [Work in pattern to marker, k1, yo, sk2p, yo, k1, ssk, k1, yo, sk2p, yo, k1, slip marker] 4[4, 4, 5, 5, 5, 6] times, work in pattern to end. 107[107, 107, 133, 133, 133, 159] sts. Decrease Row 5 [RS]: [Work in pattern to marker, k1, yo, sk2p, yo, ssk, k1, yo, sk2p, yo, k1, slip marker] 4[4, 4, 5, 5, 5, 6] times, work in pattern to end. 103[103, 103, 128, 128, 128, 153] sts. Decrease Row 6 [RS]: [Work in pattern to marker, k1, yo, sk2p, yo, ssk, yo, sk2p, yo, k1, slip marker] 4[4, 4, 5, 5, 5, 6] times, work in pattern to end. 99[99, 99, 123, 123, 123, 147] sts. Next Row [WS]: K1, p2tog, work in pattern to last 3 sts, ssp, k1. Next Row [RS]: BO 11 sts, work in pattern to last st, slip last worked back to left needle and pass last st of row over this st. Break yarn, leaving a long tail to use for seaming. Leave remaining 71[71, 71, 91, 91, 91, 111] sts on needle; proceed to yoke. Joining Row [WS]: Work in pattern to first set of BO sts, place marker, work held sts of left sleeve, place marker, work in pattern to next set of BO sts, place marker, work held sts of right sleeve, place marker, work in pattern to end. There are 271[287, 311, 365, 389, 405, 469] sts on the needle: 29[33, 39, 42, 48, 52, 58] sts for each front, 71[71, 71, 91, 91, 91, 111] sts for each sleeve, and 71[79, 91, 99, 111, 119, 131] sts for back. Important: If you have not completed all neckline shaping rows, remember to continue shaping neckline as you work the yoke. Row 1 [RS]: [Work in pattern to 2 sts before marker, k2tog, slip marker, ssk] four times, work in pattern to end. 8 sts decreased. Even-Numbered Rows 2-8 [WS]: Work all sts in pattern. Row 3 [RS]: Work as for Row 1. 8 sts decreased. Row 5 [RS]: [Work in pattern to 4 sts before marker, yo, sl 1, k1, pass slipped st over, k2tog, slip marker, ssk, k2tog, yo] four times, work in pattern to end. 8 sts decreased. Row 7 [RS]: [Work in pattern to 3 sts before marker, yo, k3tog, slip marker, sssk, yo] four times, work in pattern to end. 8 sts decreased. Next Row [RS]: [Work in pattern to 2 sts before marker, slip these 2 sts to right needle, remove marker, slip 2 sts back to left needle and place marker on right needle; yo, sl 1, k3tog, pass slipped st over, yo] four times, work in pattern to end. 4 sts decreased. Raglan Decrease Row [RS]: [Work in pattern to 2 sts before marker, k2tog, slip marker, yo, sk2p, yo, ssk] four times, work in pattern to end. 8 sts decreased. Repeat these 2 rows 24[24, 29, 29, 39, 34, 44] times more. 67[51, 57, 81, 57, 71, 87] sts remain: 3 sts for each front, 21[13, 11, 23, 11, 13, 21] sts for each sleeve, and 19[19, 29, 29, 29, 39, 39] sts for back. Use safety pins to mark positions for 8 buttonholes, evenly spaced along right front edge below beginning of neckline shaping. Place safety pins several sts back from edge. Using longer circular needle and beginning at lower right front corner with RS facing, pick up and k 1 st in each slipped st along right front edge, 1 st in each BO st around neckline, and 1 st in each slipped st along left front edge, ending at lower left front corner. Work 3 rows in 1x1 Rib, ending with a WS row. Buttonhole Row [RS]: [Work in pattern to desired position of buttonhole, ending with a k st; yo, k2tog] eight times, continue in pattern to end. 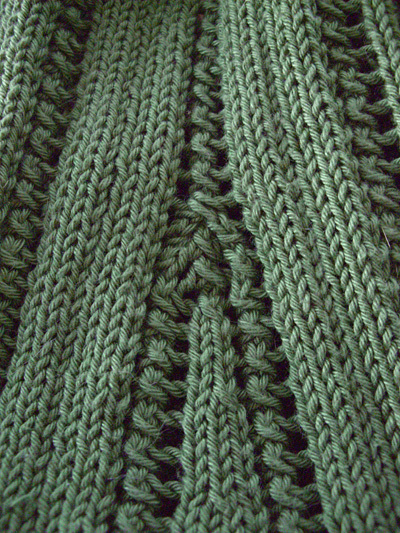 Work 4 more rows in 1x1 Rib. Loosely BO all sts. Sew sleeve seams. Sew sleeves to lower body at underarms. Weave in ends and block, gently stretching front bands as necessary. Sew button to left front band opposite buttonholes. Snowden Becker is a film archivist who&apos;s crusading to save the world&apos;s home movies. 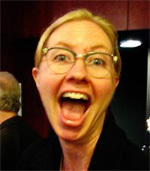 All the other knitting librarians out there will understand why she disguises herself online as TT820.